The title really caught my attention with this one as I've not heard anyone speak or write on this topic prior to this book so I was interested what this was all about. The concept of Entitlement in the sense that Townsend speaks of it seems to be a fairly recent phenomena in human development. As Townsend states on page 19 "Entitlement is the belief that I am exempt from responsibility and I am owed special treatment. Entitlement is: The man who thinks he is above all the rules. The woman who feels mistreated and needs others to make it up to her." He made some interesting comments about praise and how we often reward with praise to be positive but though well intentioned it creates bad fruit and foster attitudes of entitlement. For example praising for what takes no effort at all, praising for what is required when it should be for when they stretch beyond the norm. unspecific praise like 'you are amazing', praising ability and building identity on that i.e. sport etc, praising when not there in reality i.e. telling them they are good at things they are not rather than redirecting them to what they are good at. 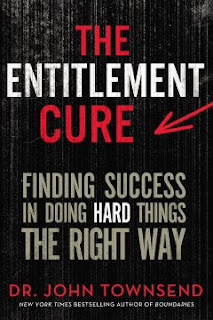 Townsend then goes on to discuss Gods framework for the right way of life and how to help others stuck in entitlement, followed by a chapter on motivation - why do the hard stuff. All good info with real life examples scattered throughout - very motivating! I won't go into every chapter at this stage. At the end of many chapters is a section titled 'Skills' which is like a think on/action list of ways to move forward with what you have just learned. While on one hand it is an easy book to read - it is a long book packed full of valuable info so I wouldn't say it's a quick read. I think this book has some very important information and it's worth picking it up to see what things you can work on in your life and what things apply to you from it as this type of book has something for everyone. Please note: I received this book from Booklook in exchange for a review - however this review is entirely my own.